The Lenovo Tab 3 has cutting edge hardware components integrated into a stylish body that gives you a fast computing experience. Lenovo Tab 3 TB-710 Tablet powered by a 1.3GHz MediaTek Quad Core processor that can tackle a variety applications without slowing down the device. The CPU partners up with a 1GB RAM, giving you smoother multitasking along with an optimized Android Lollipop OS user experience. The 7inch IPS panel display of the tab, together with speakers that are enhanced with Dolby Audio technology, provide you with an immersive multimedia entertainment. Carry your memories, favorite songs, movies, etc. with you wherever you go as the device comes with 16GB internal storage. The 2MP primary camera of the tablet can capture blur free pictures and videos that you will love to share. The device supports 3G mobile Internet connectivity, which enables high speed mobile communication. Sporting a jet black finish, the Lenovo Tab 3 TB 710 stays operational for long on a single charge as it packs in a 3450mAh battery. This Lenovo Tab 3 TB-710 Tablet flaunts a large 7inch, IPS panel display that renders striking 1024 x 600 pixel resolution visuals. Its wide angle viewing makes it easy to share what you are viewing, with your friends and family. Thanks to the Dolby audio enhancement, the tab produces a loud, distortion free sound through its stereo speakers or connected headphones. Lenovo Tab 3 Powered by a 1.3GHz MediaTek Quad Core processor, this 3G tablet from Lenovo delivers a glitch free performance. The 1GB RAM module enables you to multitask without compromising on system’s responsiveness. Built in 16GB storage lets you save volumes of data on the device itself. The 3450mAh, nonremovable Lithium Ion battery of the tab enables up to 10 hours of uptime on a single full charge. 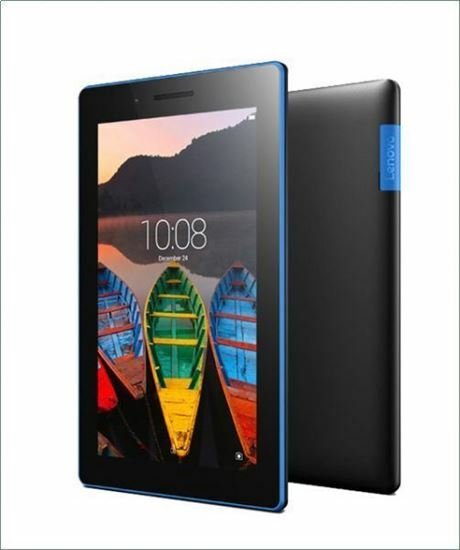 This Lenovo Tab 3 TB-710 Tablet features a 2MP rear camera that can be used to capture sharp images and blur free videos at a moment’s notice. The device also features a VGA front camera. Lenovo tabs boast of excellent wireless networking options that enable near continuous Internet connectivity near hotspots. The Lenovo Tab 3 TB 710 tablet continues this tradition by integrating 802.11 b/g/n WiFi adapter, which instantly detects and connects to an available hotspot. The device’s Bluetooth 4.0 can be used to pair this tablet with other compliant devices and transfer data wirelessly.